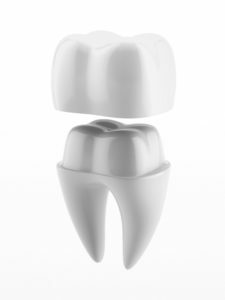 A dental crown is a single “cap” that fits over an existing tooth in order to protect it. Dental crowns are cemented in place and protect teeth that have been damaged from trauma or deep decay. A dental bridge is made up of multiple crowns. However, dental bridges are used to fill in spaces left by missing teeth. Like crowns, they are cemented on top of existing teeth, but they span across areas that may be missing a tooth or teeth. Both dental crowns and dental bridges are prosthetic devices that can provide assistance with speaking, eating, and improving the contours of your face. Dental crowns and bridges do not require any additional special care beyond practicing good oral habits. What type of dental crowns are available? Temporary: Until your permanent dental crown is made, you will likely be given a temporary dental crown to wear. Temporary dental crowns are made in our office from an acrylic-based material or stainless steel in some cases. You will only need to wear the temporary crown for a maximum of a few weeks until the dental lab fabricates your permanent crown. All ceramic or all porcelain crowns: These crowns are made from a single material, either all ceramic or all porcelain. They provide an alternative to individuals with metal allergies, as well as a more visually appealing option. These crowns can be used on either the front or back teeth. All resin crowns: the most affordable of all the crown options, these crowns are made from a durable plastic material. 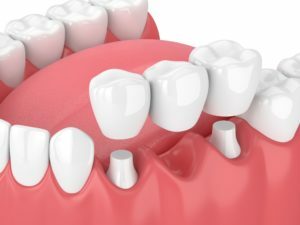 Although highly cost-effective, resin crowns are prone to damage and have a much shorter lifespan than other types of crowns. Porcelain fused to metal: Just like their name suggests, these crowns utilize a porcelain outer shell that is fused to a metal underlayer. This combination makes for an extremely durable crown option that can resemble surrounding natural teeth. However, sometimes the metal is able to be seen through the plastic and it usually causes the opposing teeth to wear down faster than normal. 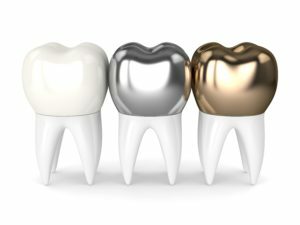 Metal crowns: Made from gold, platinum, cobalt-chromium, or nickel-chromium, these crowns are the strongest and longest lasting options for dental crowns. The fact that they rarely chip or break, along with their metallic color makes them an ideal choice for crowns in the back of the mouth that are not immediately visible when smiling. You may be a candidate for a dental bridge if you have a space left by a missing tooth, however have intact teeth on either side of the gap. Spaces left by missing teeth can cause a range of issues such as bad bites, teeth shifting, gum disease, and temporomandibular joint disorder. To find out if you are a candidate for a dental crown or bridge, and which option is best, schedule a consultation with Appletree Dentistry today. Traditional bridges: Uses a crown placed on both teeth adjacent to the gap left by the missing tooth. This is one of the most commonly used dental bridges. Traditional braces are usually made up of porcelain fused to metal or ceramic crowns. Cantilever bridges: Used when there is only one adjacent tooth to the gap left by the missing tooth, although this type of bridge is highly uncommon. It is also not recommended for use in the back of the mouth because it can cause more damage than good. 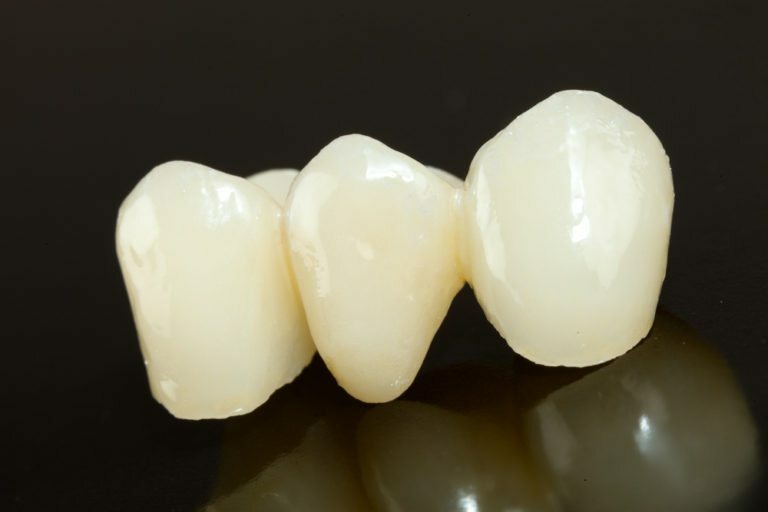 Maryland bonded bridges: These bridges use crowns made from porcelain or porcelain fused to metal, or plastic gums and teeth supported by a metal framework that attaches to the adjacent teeth. How will my dental crown or bridge be placed? Your dental crown or bridge placement will begin with the shaping of your tooth. Shaping your tooth removes extra enamel so that the crown or bridge can fit over your teeth without looking bulky. After your teeth have been properly shaped, a dental impression will be taken and then used to manufacture your custom crown or bridge. The manufacturing of your permanent restoration usually takes a few weeks, so you will be given a temporary restoration to wear until your permanent one is complete. Once completed, the permanent crown or bridge will be cemented over your teeth. What happens after the crown or bridge is placed? In the days following your crown or bridge placement, you may notice some sensitivity to hot or cold temperatures, as well as sore gums. This is a normal part of the healing process and should dissipate within a few days once your teeth and gums have adjusted to the new prosthesis. Over the counter pain medications, such as Ibuprofen, are recommended to alleviate the pain. How do I care for my dental crown or bridge? To care for your dental crown or bridge, you simply need to maintain good dental habits. Dental crowns and bridges do not require any additional care outside of brushing twice a day, flossing once a day, and visiting Appletree Dentistry twice a year for your dental checkup and professional teeth cleaning. Most dental crowns and bridges last about 5-15 years. To get the most out of your dental crown or bridge, be sure to avoid biting your nails, chewing ice, opening packages with your teeth, or grinding your teeth. These behaviors can cause your dental crowns or bridges to become damaged and require replacement sooner. 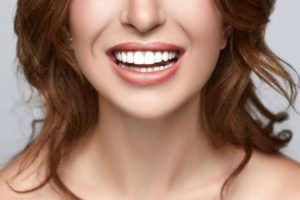 Are dental crowns and bridges expensive? Dental crowns average approximately $800-$1700 per tooth, however the final cost will depend on what material is used and how many teeth they are applied to. The good news is that if you have dental insurance, you will likely be able to get an allowance towards your dental crown or dental bridge. For simply great dental care, schedule a consultation with your Tigard dentist, Dr. Scott T. Simpson of Appletree Dentistry today!